If for some some reason you have missed the first two days coverage of the British Open and are only now tuning in you could be forgiven for thinking the tournament is in a rain delay and the networks are showing coverage of the 1977 Open at Turnberry. As it stands, after two rounds the co-leader of the tournament is Thomas Sturges Watson. That’s right, 59 year-old, five-time British Open Champion Tom Watson. The man who last won a PGA Tour event in 1998 and last won a major in 1983. For the record, his playing partner the first two days, British Amateur Champion Matteao Manassero was born ten years after Watson’s last major vistory. First Greg Norman at Royal Birkdale and now this?! Many, including myself, believed his remarkable 65 in the opening round was nothing more than a charming piece of nostalgia, and I was not alone in believing that the eight-time major champion simply could not continue to contend into the weekend. For the first nine holes in the second round, the naysayers appeared to be right. After birding the opening hole for the second straight day Watson then reeled off five bogeys in the nextÂ six holes to drop back to -1 for the tournament. But Watson, known for his swashbuckling style of play in his heyday, fought back gallantly, birding four holes against no bogeys the rest of the way and signing for an even par 70. The round was capped off by a monster putt of no less than 50 feet on the final hole that vaulted Watson back to the top of the leader board. At -5 for the tournament he currently holds the lead with Steve Marino. This story, like the one that brewed and bubbled last year with Norman, may turn out to be one of the more remarkable sports stories of the year. Surely, Waston can’t continue the fairytale run into the weekend? It’s also worth noting at while Watson is playing in the last group on Saturday at the Open Tiger Woods won’t be around to see it. But should we really be that surprised at this run by the evergreen Watson? After all, the man is practically the mayor of Turnberry. Not only does Watson have the memories of the “duel in the sun” in 1977 to draw on, he also won the Senior British Open there in 2003. He is the crowd’s darling in Scotland, and the support he has seen in the first couple of rounds has been nothing short of adoring. But does Watson himself believe he can win? For the record, Watson is attempting to shatter the record for oldest major champion, eclipsing Julius Boris who was 48 when he won the 1968 PGA Championship. Watson won his first PGA Tour event justÂ 6 years later. Now with that in mind, the Open Championship traditionally marks the halfway point in the golfing calendar. Two majors have passed, two are to come and we find ourselves smack-bang in the middle of summer on both sides of the Atlantic. I was going to write about who I saw as being the principal players at Turnberry this week, but instead I’m going to put on my tweed coat, pick up my lecturing stick, play “Professor Mackay” for a moment, and assess the performances of the players who began the year in the world’s top 10. 1. Tiger Woods – Of all the players on the world golf stage, Tiger may be the hardest to judge performance-wise. Quite simply, this is because his expectations and the expectations of those who follow the game are two completely different things. While the “so-called” scribes may see a tie for 3rd at some random event as a failure to secure a win, Tiger does not. He takes something positive out of every performance, win, lose or draw. So far 2009 has not been a banner year for Woods the way say 2000Â orÂ 2007/8, were. But that doesn’t mean it has not been a success. Yes, Woods has failed to win either of the first two majors of the year, but what he has done is come back from a career-threatening injury and reasserted his position as the dominant player in the game. He has won 3 times in 9 starts has not finished outside the top 10 in any stroke play event. He is leading both the money list and the Fed-Ex Cup race on the PGA Tour, not an easy feat with just 9 events under his belt. Most importantly (especially to him) he is making advances in his game. His win at the Memorial was a different kind of golf than he has ever displayed, hitting fairways and controlling his ball off the tee the likes of which hadÂ not been seen since is Open wins at Hoylake or St. Andrews. His game is where he wants it to be and getting better, and that’s the scary thing for everyone else. 2. Sergio Garcia – Sergio started the year in 2nd place in the world rankings, not far behind Woods who was still resting his knee back home in Florida. He won the HSBC Championship at the end of 2008 that counted towards the 2009 season, but other than that Sergio’s game has been anything but sparkling. His best finish is a T7 in Qatar on the European Tour and on the PGA Tour he has performed even more poorly. His best finish is a T10 at the U.S Open a few weeks back and he currently sits 118th in the Fed-Ex Cup. Many thought starting the year that the Sergio was going to be the player to put pressure on Woods for the top spot in the world. Nothing has been further from the truth as he has slipped to No. 5 in the world and never really challenged for a tournament win late on Sunday. With past British Open defeats still fresh in his mind, Garcia is going to have to perform admirably the latter half of the year if he is to save his 2009 from total disaster. 3. Phil Mickelson – If Phil’s golf game was a 5th grader his report cards would probably say something like this: “Phil show tremendous potential in all areas but must learn to apply himself correctly to reach his full potential.” Phil has always been a hard man to pin down- he is an enigma to be sure. His 2009 has been highlighted more by off course drama than on course heroics (or defeats, as is the case sometimes with Phil). His wife Amy was diagnosed with cancer a few months back and to make matters worse, his mother received the same diagnosis a week or so ago. Right now, I’m pretty sure golf is the last thing on Phil’s mind. On the course it has been a typical Phil year when it all boils down to it. He has won twice, at favourite haunts Doral and Riviera, but has also missed two cuts and finished outside to top 50 on three different occasions. For every late charge at the Northern Trust or major run like at the U.S Open, there are weeks where he doesn’t come close to resembling the No. 2 player in the world. Perhaps a lot of that is to do with the off course soap opera he is currently dealing with, but inconsistency has also been a hallmark of the entire Mickelson career. If he ever seriously wants to catch Woods (or at least push him) he must find a way to narrow the gap between when he plays well and when he does not. Of course, that’s going to be pretty hard with no tournament play on the horizon. 4. Padraig Harrington – What can you say about Paddy? Irish, lovable, committed. At the end of 2008 we thought he had it all figured out. With 3 majors wins in the last 6 events he had climbed toÂ a career high of No. 3 in the world. Paddy seemed to be the guy that was going to become famous for being there at the end when the big ones are on the line. But so far 2009 has been a throw away year for Harrington. The man who everyone thought had it all figured out has missedÂ six of 13 cuts on the PGA Tour and not done a whole lot better in Europe. With only one top 10 in 17 events worldwide, and a slide to world No. 14, it’s hard to keep putting him on the list of top players in the world. His friend and sports psychologist Bob Rotella said Harrington’s only fault is “tinkering” with his game too much- always seeking perfection. Clearly that formula has not worked for Harrington this season. What has worked is winning the non-sanctioned Irish PGA which he has done the past two years in preparation for the Open Championship. And lookie here, he went and did again last week. Maybe, finally, he’s back on the right track. 5. Vijay Singh – The Energiser Bunny of the PGA Tour has shown no sign of slowing down playing-wise as he approaches the twilight of his PGA Tour career. The man who now owns the record for most wins in his 40’s is still playing more on the PGA Tour than just about every top player in the game. However, as opposed to previous years, the “Big Fijian” seems to be showing some signs of slowing down. So far this year he has fallen from 5th to 10th in the world, the lowest position he has held since he fell to No. 8 in 2002. Currently sitting in 48th place on the money list, he has posted justÂ three top 10’s, and has not seriously contended for a victory all season. Although it is not well documented, Vijay has also been going through some off course issues the past year or so. For the man who is used to finishing in the top 10 during his poor weeks, 2009 must surely have him scratching his head. There’s one thing that is for sure though, he’s going to work his way out of it, and not a practice range in sight is going to be safe when he decides to get his groove back. 6. Robert Karlsson – Not much was known of Karlsson at the beginning of 2009 over this side of the pond. He is the quiet kid in class, the one that, despite standing out like a sore thumb, does not make a lot of noise. I am fortunate to work with the same swing coach that Karlsson employs and he gave me a little tip about 12 months ago. He said watch out for Robert Karlsson, if he refines his short game there is no telling how good he could be. Ending 2008 he was as hot as any player on the planet, almost pulling off three wins in a row to close the European Tour season. 2009 has been another story altogether. By playingÂ in the Ryder Cup Karlsson was granted a PGA Tour membership, and like any top world player not from America, he has attempted to become a “world golfer” splitting his time between Europe and America. That was the plan, however, and what was supposed to be his breakout year has turned into one plagued by injury. He has played just eight events worldwide and has had to pull out of the lastÂ three events in Europe due to a nasty eye infection. Because of this I will have to give him a pass. He has fallen to No. 16 in the world, but it’s not totally is fault. I will need to see a note from his doctor though. 7. Camilo Villegas – The young Colombian had a break out year in 2008, establishing himself at the very top of the class. This season he has done little to suggest he will not stay in the upper echelons of the game for many years to come. With his strong will, mind and game to match he is very much considered the “most likely to succeed” of all the young guns on tour. “Spiderman”, as they call him, has put up some solid, if unspectacular numbers so far in 2009. He has recorded three top 10’s with a top finish of T3 at the Buick Invitational, missed onlyÂ two cuts in 13 events worldwide, and currently sits 35th in the Fed-Ex Cup race. Although he has dropped back to No. 12 in the world, the statistics show that he has not performed poorly at all, in fact, throw in a win and Villegas would have a very solid 2009 going. He came on strong at the end of last season, winning the final two Fed-Ex Cup events, and with no lack in strength or fitness, there is nothing to suggest the rest of 2009 is not going to continue to improve for the young man from Medellin. 8. Henrik Stenson – Like Villegas, Stenson came into 2009 with high hopes of making an impression on the very top of the world rankings. Also like Villegas, he has spent much of the year playing solidly but ultimately treading water. Stenson has made 10 of 13 cuts in 2009 and has thrown inÂ four top 10’s for good measure, including a T2 in Qatar where he came up three shots shy of Alviro Quiros. His final round 68 at the U.S Open was bettered only by fellow Ryder Cupper Ian Poulter, however his 9th place finish at Bethpage came on the heels for two very comfortable missed cuts the previous two events in Europe. These inconsistencies have led to Stenson retaining his position at No. 8 in the world, but considering his talent and penchant for winning against high class fields, no doubt he will be hoping for a stronger end to 2009, perhaps beginning this week at Turnberry. 9. Ernie Els – We have come to expect a lot of The Big Easy over the span of his spectacular international career. He is talented, likeable and capable of absolute brilliance at times, but it seems as if the past couple of seasons Els has had a career handbrake on. Since his career-threatening knee injury a couple of seasons ago (which required a surgery similar to Tiger’s) Els has been on a constant slide towards mediocrity, something that he has never had to deal with in his career. At the end of 2007 he was ranked 4th in the world. At the end of 2008 he was back to No. 9. Now, a mereÂ seven months into 2009 and he is all the way back at No. 24. Ernie Els, the 24th best golfer in the world? It seems preposterous to even consider such a notion. But the facts don’t lie, and although Els has producedÂ five top 10’s around the world this season, he has fallen short in the games biggest events- the events he prides himself on wanting the most. AÂ Â T45 at the Players, coupled with missed cuts at both the Masters and the U.S Open spell trouble for the big South African. Whenever he is questioned by the media about his career trajectory Els inevitably responds by saying he is working harder than ever on his game and he is completely committed to winning the big ones. He is a contentious Hall of Fame lock and will forever be considered one of the best players of his generation. He turns 40 in a few months which means there are plenty of good years still available for Els to cement his legacy in the game, let’s hope for his sake the rest of 2009 brings about some major changes. 10. Lee Westwood – During the opening match of the Ryder Cup at Valhalla Lee Westwood took is unbeaten run to 12, setting a Cup record for most matches without a defeat. He ended 2008 atÂ No. 10 in the world, a position that most would agree sits pretty well with Westwood. He has always been a European Tour stalwart, and since his game has re-surged over the past couple of seasons he has taken back his rightful place at the top of the European Tour pecking list. That being said, 2009 is just starting to really get going for Westwood who has slipped back to 17th in the world rankings. Although he has missed just one cut in 16 events against some of the strongest fields in golf, he has not put up the sort of results he would have anticipated at the start of the year. That was until two weeks ago when he closed with a spectacular 65 at the Open de France to force a playoff with red-hot German Martin Kaymer, only to be defeated on the first playoff hole. He followed that narrow loss with T8 last week at the Barclay’s Scottish Open signaling that his 2009 might just be getting fired up. There is no doubt Westwood is a player capable of winning a major as he proved in 2008 at Torrey Pines, and for a player with all the game and confidence in the world that is the logical next step. With the current form he is carrying, who is to say this week won’t be his week? Note: For those wondering, here are the current top ten players in the world and their movements since the beginning of 2009. The Open Championship returns to Turnberry after far too long of an absense from the west coast of Scotland. The Open hasn’t been contested at Turnberry since 1994. Which means the last time the Championship was contested there, I was 10 years old, and had never even held a golf club. The Aisla Course is lauded by pros and pundits as being one of the finest Open venues. Having never seen the course on television before, the one thing I keep hearing about Turnberry is that it is a shot maker’s paradise which always identifies the best player in the field. In fact, Turnberry has hosted the Open on three prior occasions with the player ranked number one in the world at the time (Tom Watson 1977, Greg Norman 1986, Nick Price 1994) holding the Claret Jug at the end of the week. The Favorite: Tiger Woods. No surprise here. But, what is surprising is how much of an overwhelming favorite he is. Woods is installed at 2/1 to win his 4th Claret Jug, where as the next closest option is Sergio Garcia at 20/1. To me this is just a testiment as to how wide open the field is this week, with the exception of Woods. With Mickelson back home, and Harrington struggling to make cuts, the tournament is there to be had for whoever wants it. But, I just think Tiger is due. And history is on his side. Contenders: Sergio Garcia. Always the bridesmaid and never the bride, Garcia has had his share of disappointments and heartbreak at the Open Champion more so than any other major. After nearly going wire to wire to win at Carnoustie in 2007, before painfully losing to Padraig Harrington, I wondered if he would ever win. But, this could be his best chance yet, with several heavy hitters either missing or struggling. Paul Casey: The newly minted world number 3, and a guy who has a game for seemingly every golf course he steps on. Casey is easilly one of the best ball strikers in the world, who has the ability to control his ball in the wind better than almost anybody. With the weather forecasted for the week, negotiating the wind and elements will be crucial. Camilo Villegas: Another low ball hitter who has the all around game. This guy is a stud who is going to win a lot of golf tournaments during his career. I would be surprised to see him outside of the top ten at weeks’ end, and could end up in the winner’s circle. Hunter Mahan: The one American player not named Tiger that I really like this week. The guy is just a grinder who will not be phased by potentially awful weather. Hunter could have won the U.S. Open last month but caught a HORRENDOUS break when his approach shot smacked the flagstick at the par 4 16th and careened off the green. Mahan has played well all year, and I expect it to continue. Dark Horse: David Duval. This pick is almost too obvious, but I would love to see it happen. Does Duval’s comeback story have a second act? It was eight years ago in the Open at Royal Lytham and St. Anne’s where DD last won a professional tournament. On a sidenote, I also really like Geoff Ogilvy at 30/1 and Henrik Stenson at 33/1. Enjoy the golf everyone, I will be setting my alarm to wake up bright and early. Cheers! Tiger Woods has been checking the weather forecasts for Turnberry in Scotland as he prepares for his first British Open tournament since 2007. The world number one, who missed last yearâ€™s event because of injury, said the unpredictable British weather is what makes the Open so special, forcing players to re-draft their game-plans even at the last minute. â€œI hadnâ€™t played the course prior to this week, but did watch video of the 1994 British Open. They’ve changed the course since then, adding bunkers and length, so I’m not sure what weâ€™re going to get. Woods will be without his coach Hank Haney this week, though he is confident about his swing. The American-Thai said he would decide whether to carry a 5-wood or 2-iron once he completes his practice rounds. Woods has played well prior to the first two majors of the year. He won PGA Tour events before the US Masters and US Open but failed to land the majors despite some strong performances. It is a familiar story going into the Open with Woods winning the last tournament he played, the National, two weeks ago. 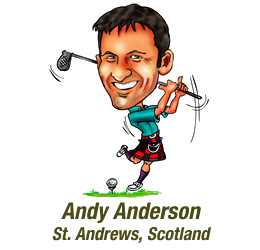 He hopes the putting that served him well at the Congressional Country Club will also be of use in Scotland. Padraig Harrington wanted to play in the Irish PGA Championship mainly to get in some links golf and boost his confidence ahead of the British Open. He achieved both targets in emphatic style, winning the tournament for the third straight year and eyeing a similar feat at the Open, played this year at Turnberry. Although the Irish event is a side show to the Scottish Open in Loch Lomond, won by Germanyâ€™s Martin Kaymer for his second victory in a row, Harrington didnâ€™t want to break a habit that has brought him success for the past two years. In 2007 and 2008, he stepped off the Irish links to win the Open. With his latest victory in his homeland, Harrington is halfway to repeating his feats of the past couple of years. Winning an Open title is tough any year and this year will be no different with Tiger Woods returning after last yearâ€™s injury-enforced absence to boost the field. Harrington scored a seven-shot victory over former British Amateur champion Brian McElhinney at the European Club in Brittas Bay. On the European Tour, meanwhile, Kaymer became the first German to win the Scottish Open when he triumphed at Loch Lomond, continuing his hot streak after last weekâ€™s play-off victory over Lee Westwood in the French Open. Kaymer, 24, closed with 69 to finish at 15-under and beat Franceâ€™s Raphael Jacquelin and Spainâ€™s Gonzalo Fernandez-Costano by two strokes. South African Retief Goosen was in the mix going into the last day but he could only manage 73 in the final round as he shared fourth place, on 272, with Soren Kjeldsen, of Denmark, Australian Adam Scott and American Nick Watney. An interesting name in the top 20 was former Open champion Ernie Els. The South African, who is aiming to get back to the top, was tied for 13th with Geoff Ogilvy, Brian Gay and Miguel Angel Jimenez on 277, eight strokes off the pace. While the men are looking forward to one of the biggest majors of the season, the women have already completed one of theirs with South Korean Ji Eun-hee triumphing at the US Womenâ€™s Open in Bethlehem, Pennsylvania. Ji nailed a massive 20-foot putt on the 72nd hole to claim a famous victory after Cristie Kerr saw her lead evaporate. Her final round of 71 gave her a total of even-par 284 and a one-stroke victory over Candie Kung, who closed with 69. Kerr had held the lead even up to the back nine but her final round of four-over 75 was not enough to ensure the crown. She finished in a tie for third with Kim In-kyung on 286. Brittany Lincicome was one stroke behind in fifth while Paula Creamer, Ai Miyazato and Suzann Pettersen were joint sixth on 288. On the US PGA Tour, Steve Stricker shot a seven-under-par 64 for a total of 264 for victory at the John Deere Classic in Silvis Illinois. He was three shots ahead of a trio of players â€“ former US Masters champion Zach Johnson, who shot 66 in his final round, Brandt Snedeker (65) and Brett Quigley. It was Strickerâ€™s second title this year and the sixth of his career. When discussion arises about the next European golfer to win a major, the names that surface are usually pretty predictable. Garcia, Stenson, Westwood, Casey- so the list usually goes. And while most pundits are proclaiming Rory McIlroy the next superstar of European golf (and rightly so), another youngster has quietly been going about his business, amassing tour wins and Race to Dubai points at a rate few have matched this year. I’m talking about the man that has won the last two events on the European Tour- Martin Kaymer. I first recall hearing about Kaymer a couple of years ago when he was playing on the EPD Tour in Germany. My Scottish roommate at the time was going through the scores on the various European tours and came across something remarkable. Somebody had shot 59 on the EPD Tour, andÂ it turned out to be Kaymer. After shooting such a low number my roommate and I kept and eye out for his name in various events. A couple of months later we noticed that he had won on the Challenge Tour despite not having a card there at the start of the season. Three months later and he had won again, finished in the top 5 6 times, his worst finish a tie for 13th, and ended the season 4th on the Challenge Tour Order of Merit despite only playing 8 events. “Who was this guy?” we wondered. Wonder, we no longer do. In hisÂ two and a halfÂ seasons on the European Tour Kaymer has made a name for himself as one of the top young players in Europe. Still only 24 years of age, he has recorded 4 tour wins since 2007, been named rookie of year and narrowly missed out on qualifying for the Nick Faldo’s Ryder Cup side. His performance the past two weeks on tour has sounded his name as one of the favourites for next week’s Open Championship at Turnberry. Kaymer though, is quick to dismiss the claims. The win has moved Kaymer to second in the Race to Dubai behind Paul Casey and to No. 11 in the world rankings, but most importantly he takes incredible form into Turnberry as he attempts to become the first playerÂ in 2009 to record three European Tour wins. Mutinies are historically associated with pirates and sea-faring ships. They are not, usually, associated with putters and professional sports. However, that’s exactly what has transpired this week as a number of LPGA players have called for, and possibly received, the resignation of LPGA commissioner Carolyn Bivens. In the same week as the biggest event event on the women’s golf calender, the U.S Women’s Open, several of the game’s biggest names, led by Suzanne Pettersen, have gone out of their way to call for Biven’s resignation, sending an open letter to the LPGA board asking for a change in personnel at the very top of their organization. It was reported earlier in the week by Golfweek that a meeting of several high profile players, including world number one Lorena Ochoa, Natalie Gulbis, Paula Creamer and Cristie Kerr met for dinner earlier in the week to discuss the current state of the tour. Out of that dinner came the letter signed byÂ 13 players asking for Biven’s resignation. Creamer is so farÂ the only other to admit signing the letter. Bivens, and the tour board itself, have been under fire in recent months, as the tour struggles to secure sponsorship and events for 2010. At the present time the LPGA Tour has only ten events on its schedule for next season. Since 2007 the tour has lost seven events, three of which were held at the beginning of the season in Hawaii. Six other events are currently without a sponsor including one of the tour’s biggest events in China. Bivens, who took over as LPGA Tour commissioner in 2005, now has her future as head of the tour in question, and it is still unclear as to her fate. Yesterday Golfweek reported that sources close to the Tour have confirmed that Bivens will not have her contract honoured for her final two years in office. The article went onto report that the LPGA board of directors has been meeting “behind closed doors” all week to discuss the future of the Tour and the (reportedly) vacant commissioner position. Bivens has not commented on the alleged ousting and the Tour itself has been reluctant to comment as well. No official announcement has been made and Bivens herself has yet to comment. “Carolyn has not resigned,â€™â€™ David Higdon, the LPGAâ€™s chief of communications said in aÂ shortÂ email to Golfweek earlier in the week. However, Sporting Business Daily, working with anonymous sources, has learned that Bivens has agreed to a buyout on her contract to the tune of $500,000 per year for the two years she has left on her contract. The article went onto say that the board as already organized a golf industry insider to interview potential replacements for Bivens. While the biggest event of the year continues today in Pennsylvania, the headlines continue to be dominated by the fate of the Tour’s leadership. “Patience is the No. 1 thing you have to have this week,” Ochoa said of the U.S Women’s Open. She could just have easily been talking about the Tour itself. In what appears to be a pincer movement on the Aussie-backed OneAsia Tour, the Asian Tour and European Tour have joined forces to create a regional mega-organisation to strengthen their presence. EurAsia Golf Ltd is a new alliance between the Asian Tour and European Tour and represents a tangible joint venture in which a company has been set up featuring representatives from both sides. Over the past year, OneAsia, led by the Australasian PGA Tour with help from China, Korea and India, has threatened to move in on the Asian Tourâ€™s turf with a six-tournament schedule, although this was later reduced to five. And indeed, the Asian Tour seemed to be feeling the blows as a handful of sponsors and tournaments pulled out. However, this new organisation at least shows where the Europeansâ€™ loyalties lie. According to an Asian Tour press release, the alliance aims to fortify existing co-sanctioned tournaments, launch new ones and strengthen relationships with sponsors, promoters, national associations and governing bodies. Asian players have been great beneficiaries of jointly sanctioned events with Taiwanâ€™s Yeh Wei-tze, Indiaâ€™s Arjun Atwal and Jeev Milkha Singh, Thailandâ€™s Thongchai Jaidee, Thaworn Wiratchant and Chapchai Nirat, Koreaâ€™s Charlie Wi and Chinese duo Zhang Lian-wei and Liang Wen-chong having won such tournaments in the past. Up to now there have been 56 co-sanctioned events since the first one in Malaysia in February, 1999. Asian countries that have hosted joint tournaments are: China, Hong Kong, India, Indonesia, Korea, Malaysia, Qatar, Singapore and Taiwan. Among the big names who have enjoyed success in Asia are: Ernie Els, Retief Goosen, Padraig Harrington, Phil Mickelson, Jose Maria Olazabal and Vijay Singh. The European Tour has reinvented itself with the launch of the Race to Dubai concept this season, which replaces the previous Order of Merit. The Tour culminates in the US$20 million Dubai World Championship. During the filming for the latest episode of HomeofGolf.TV we were nearly hit by a golf ball from the second tee on the Old Course. Luckily a shout of “fore” meant we ducked and could continue filming on the 17th hole with no harm done! Padraig Harrington was written off at the final two majors of the year in 2008. He won both of them. He is similarly being sidelined ahead of this yearâ€™s British Open in Turnberry, especially after failing to make the cut at last weekâ€™s French Open. But the Irishman is hoping the formula that helped him to the past two Open titles will once again enable him to take a hat-trick of wins. The three-time major winner is set to play in the Irish PGA Championship on the European Tour this week with the hope that links practice can gear him up for the Turnberry test. The popular Harrington has missed the cut in his last five tournaments but showed at last yearâ€™s Open in Birkdale that he has the ability and mental strength to overcome difficult times. He entered the 2008 tournament as defending champion and with an injured wrist but that didnâ€™t stop him from claiming his second straight title. One factor that Harrington never needed to contend with at last yearâ€™s Open was Tiger Woods, who had just started an eight-month lay-off to undergo knee surgery. Woods, who last week won his third US PGA Tour title of the season, is being touted as among the favourites for the title this year having missed out on the US Masters and US Open. While the young guns provided a window into the future, Tiger Woods showed them just who owns the AT&T National. As the â€œgreedy hostâ€ he promised to be, Woods took the lead with a 20-foot birdie on the 16th and then parred the final two holes for his 68th PGA Tour victory. Hunter Mahan equalled the course record set by Anthony Kim Thursday with a final-round 62. That was good for second place. Both Mahan and Kim are seen as challengers to Woodsâ€™ top ranking. But not just yet as the world number one continued his successful comeback from a knee operation that sidelined him for eight months. However, Woodsâ€™ mind is probably thinking of Britain, for more than one reason. First, his good friend, tennis king Roger Federer won Wimbledon for his record 15th Grand Slam. Then there is the British Open – the season’s third major. Woods is still waiting for the golf equivalent of Federer’s achievement â€“ his 15th major. It failed to come at his first comeback major, the US Masters. Then Woods was unable to defend his US Open crown at Bethpage Black last month. The British Open at Turnberry is his next chance at a major as he pursues Jack Nicklausâ€™ record of 18. It is only a matter of translating his Tour form to the majors, something Woods has plenty of experience doing, except this year, in which he has so far won the last tournaments he had played before the majors. On the European Tour, German Martin Kaymer won the France Open at Le Golf National when he beat Englandâ€™s Lee Westwood in a play-off. Both players finished on 13-under 271 for the tournament after Westwood stormed into a contention with a final round of six-under 65. However, Westwood found water in the play-off and bogeyed while Kaymer, who closed with 68, birdied the 470-yard, par-four 18th for victory. It was Kaymerâ€™s third title on the European Tour and lifted him into the top 20 of the world rankings. Englishman Ian Poulter was third, three strokes behind, after his closing round of 67 while Denmarkâ€™s Anders Hansen (66) and Swede Peter Hanson (70) were tied for fourth on 275. Irelandâ€™s Padraig Harrington, the British Open champion who defends his title in two weeks time, failed to make the cut after opening rounds of 72 and 75. Meanwhile, South Korean Yi Eun-jung almost had nothing to show after squandering a six-stroke lead but held on in the play-off to win the Jamie Farr Owens Corning Classic in Ohio. Yi beat Morgan Pressel on the first play-off hole for her first LPGA victory, having started the day four shots ahead and then increasing it to six with a couple of birdies out of the gate. However, Pressel slowly chipped away at her lead and ended on four-under-par 67 to tie Yi, who made even-par 71, on 18-under 266. Yi made birdie in the play-off while Pressel tapped in for par after narrowly failing to hole a birdie putt. Michelle Wie continued her solid form in her first season as a full-time LPGA pro with a career-best 64 for a total of 268. She was tied for third with Lee Seon-hwa and Kim Song-hee. World number one Lorena Ochoa, of Mexico, was tied for eighth with two other players on 270. For Yi, the victory was a significant improvement on her recent form in which she failed to make the cut in four of seven starts in 2009. Her previous best finish was 26th at the Corona Championship. Let’s face it. Not everyone has the flexibility and/or strength to make a full shoulder turn behind the golf ball. Making a good turn is essential in trying to build a powerful golf swing. But, if you’re like me, you always found it difficult to wind up Â your upper body like a corkscrew in an attempt to generate power. It’s something I struggled with for quite a while, but I managed to get enough distance out of my 1.93 meter (6’4″) frame for it not to be a major concern. Last April during The Masters telecast here in the States, the CBS Sports analysts were breaking down the excellent golf swing of Trevor Immelman. Â One of the analysts mentioned something interesting that Trevor is now doing in his set up that struck a cord with me. For years I had always been told to position my feet at a 45 degree angle to help promote an easier weight shift on the way back, and on the way down. I never really questioned it until I saw what Trevor was doing at Augusta. Immelman turns his right foot (for a right handed player, left foot for a lefty) IN as opposed to the traditional method of standing with toes pointing outwards. Why does he do this? For the reasons I explained above, to generate a bigger shoulder turn. When you turn your back foot in towards the golf ball, this restricts lateral movement of your lower body. Your lower body generally helps you complete your backswing, when you restrict it’s movement it forces you to finish the swing with your upper body more than you usually might. This also creates quite a bit of resistance between your upper body and lower body, and during the golf swing, resistance can translate into power. It took me about three or four range sessions to incorporate this new sequence into my swing. Positioning your foot that way will feel awkward at first, but it should feel awkward, anything new or different should. I started to feel a little strain in my left shoulder after the first couple of sessions, but that just let me know I was making a bigger turn, and my shoulder was just adjusting to the new move. My natural ball flight had always been a slight cut, but one other thing I noticed is that the cut turned into a straight ball. The only reason I can think of for this happening, Â is that restricting my lower body eliminated any “sway” or shifting that might have caused my club to get off plane or the face to open. This caused me to hit the ball slightly more from the inside than I usually do, which caused me to lose that slight cut. I don’t mind this at all, I love hitting the ball straight. This swing tip may not be for you, because this may not solve your problem. But, it helped me hit the ball longer, higher, straighter, and more consistently, which is what everyone should strive for. Ponder this, if you would, dear golf fan. How many double eagles (albatrosses for those outside the U.S) have you seen with your very own eyes? Chances are none. I’ve been playing with some of the best amateurs and professionals around the world for the last ten years and I have yet to see one in person. How about on television? The PGA TourÂ and European Tour have provided the golfing world with a combined 31 Double Eagles since 2005. Vegas odds makers put the chances of the average golfer scoring a double eagle at around 6 million to one. Approximately 40,000 holes in one are recorded on U.S courses every year, compared to only a couple hundred double eagles. They are a rare bird indeed. Apparently Rafa Echenique knows none of this. Last week at the BMW International Open on the European Tour Echenique came to the par 5 72nd hole four shots adrift of Englishman Nick Doughtery. He stood in the middle of the 18th fairway, 245 yards from the hole at -18 for the tournament. Doughtery was clearly in the driver’s seat as he pushed for the biggest win for his career and his first on tour in two years. One swing later the Argentinian had holed out for double eagle, moved to -21 under for the tournament and, most importantly, moved to within one of Doughtery’s lead. It all happened in an instant. The pin was cut in the back left hand corner of the green, obscuring the bottom of the cup from the players in the fairway. Echenique’s ball landed in the middle of the green, and drew to the back corner where the hole was cut. It ran out with perfect speed, catching the left-center of the jar. Echenique had already acknowledged the crowds applause when the ball struck the putting surface, but as the crowd exploded so too did theÂ diminutive Argentinian, raising his 3 iron in the air he hugged his caddie, and practically boundedÂ down the rest of the fairwayÂ to the green where he was greeted by several of his fellow countrymen in the grandstand. Echenique ran to the stands to embrace his friends before returning to claim his ball from the bottom of the cup. If Doughtery had stumbled, as he has on occasion over the past two years when chasing a “W”, it might have been the most improbable finish to a professional event in recent memory. According to the leading authority on the subject, doubleeagleclub.org, the last double eagle scored on the European Tour was recorded by Sweden’s Joakim Backstrom at the 2008 Russian Open. The last person to hole out on the final hole of a tournament was Graeme McDowell at the Open de France in 2003, and that is the only time in recorded history it has ever happened on the final hole of either a European or PGA Tour event. McDowell finished tied for 18th. After the tournament Echineque spoke not like he had finished outright 2nd, but rather as if he had won the event itself. In the afternoon of April 7, 1935, the Squire, Gene Sarazen, accompanied by his Caddie, “Stovepipe”, came to the par-5, 485 yard, 15th tee at Augusta National Golf Club. He was trailing Craig Wood, who was finished with his final round and waiting in the clubhouse with a score of 282, by 3 strokes. Geneâ€™s drive off the tee went 250 yards and foundthe fairway. He had 235 yards to go to the pin on the green. There is a pond that separates the fairway from the green that crosses directly in front making a “run up” to the pin impossible. After talking with Stovepipe, Gene selected his 4-wood for the extra loft it delivers for his second drive from the fairway. He swung the 4-wood and stuck a low line drive that delivered a shot that peaked 30 yards in the air. It was long enough to carry the pond guarding the greenâ€¦ bounced once and rolled to the cupâ€¦ then gently hit the pin and fell in. Gene Sarazen had scored a “double eagle” duce, three under par, to tie Craig Wood who waited in the Clubhouse. “The shot heard around the world”. The first double eagle recorded during tournament play. Approximately 20 people witnessed the feat. One of them was Augusta Nationals founder, Bobby Jones. Many consider that shot, that win, and that tournament as the tipping point for the growth of the Masters from a highly regarded invitational event to one of golf’s elite professional majors. It was a truly momentous occasion. Echenique’s shot may not have been “heard around the world”, heck, it didn’t even win him the BMW International Open, but few can argue it wasn’t one of the most exciting shots and finishes to a tournament in a long time. If you don’t believe me, just keep note of the next time you hear of a professional holing out for double eagle on the final hole to (almost) win a professional event. My bet is it’s going to be a while. I wonder what odds Las Vegas would give to see that? Kenny Perry will not let people forget him. The hard-working professional, a cut above journeyman, was the best player in the world aged over 40 last year. After his loss to Angel Cabrera in the US Masters final, the Kentucky man returned to our collective conscious. And he refuses to go away, at 48 years old. Perry won his 14th career US PGA Tour victory in record style with his triumph at the Travelers Championship in Cromwell, Connecticut over the weekend. He steamed past fellow American Paul Goydos in the last round, shooting seven-under-par 63 for a record four-day total of 22-under-par 258. That was two strokes better than the previous record held by Notah Begay. The performance included tying the course record of 61 on the opening day. Goydos, who still managed to score a respectable 67, finished in a tie for second place with David Toms, who closed with 65. Ryan Moore, Hunter Mahan and Ben Curtis tied for fourth on 263 with the first two golfers both shooting 64 in their final rounds. There was another player reminding the world that he was still around on the other side of the Atlantic. Nick Dougherty returned to winning ways after a long tournament drought when he won the BMW International in Munich in European Tour. The Englishman shot a final round of 64 to score a one-stroke victory over Rafa Echenique and claim his third career victory. Dougherty finished on 22-under-par 266 as Echenique finished in dazzling style with an albatross two on the par-five 18th to just miss out on a play-off. The victory also earns him a spot in the British Open at Turnberry and provides a timely boost to his career. Dougherty, who led the US Open two years ago, has since slipped out of the worldâ€™s top 100. With his star being overtaken by other British stars led by the likes of Paul Casey and Rory McIlroy, Dougherty has once again put himself in a position to regain his prestige. On the LPGA Tour, South Korean Shin Jiyai won her fifth title in 11 months when she triumphed at the Wegmanâ€™s tournament in Rochester, New York. Rookie Shin closed with a one-under 71 for a total of 17-under 271 and a seven-stroke victory over Taiwanâ€™s Tseng Yani and Kristy McPherson. The 21-year-old is already well ahead of her targets for the season. She was hoping to win Rookie of the Year. That is a distinct possibility but she also finds herself on top of the LPGA money list after her second victory over season. Golf is a naturally green-friendly sport. After all, practically half of all strokes are played on a surface called â€œthe greenâ€. In some places around the world, the building of golf courses has been hailed as a boon to the environment. More than a decade ago, South African legend Gary Player said the island-course he designed for Hong Kong’s first public facility helped boost the population of birds and enhanced the surrounding environment. Tailor-made for a green theme is Brunei, the oil-rich sultanate in the heart of Borneo, which is home to some of the richest rain forests, flora and fauna in the world. Organisers of the Brunei Open, from July 30 to August 2, have decided to adopt a green theme for the fifth edition of their tournament, and have roped in government and Asian Tour support for their cause. He did not go into details as to what the activities were but the fact that players will be involved will certainly helped to raise awareness of the rain forest, which is dwindling fast on the Borneo island that also includes Malaysia and Indonesia from illegal logging and urbanisation. The theme is being wholly embraced by the Asian Tour, whose chairman Kyi Hla Han is keen to have his players involved. The Brunei Open is the second event after the restart of the Asian Tour’s 2009 calendar following a tournament in Indonesia. Australian Rick Kulacz is the defending champion.